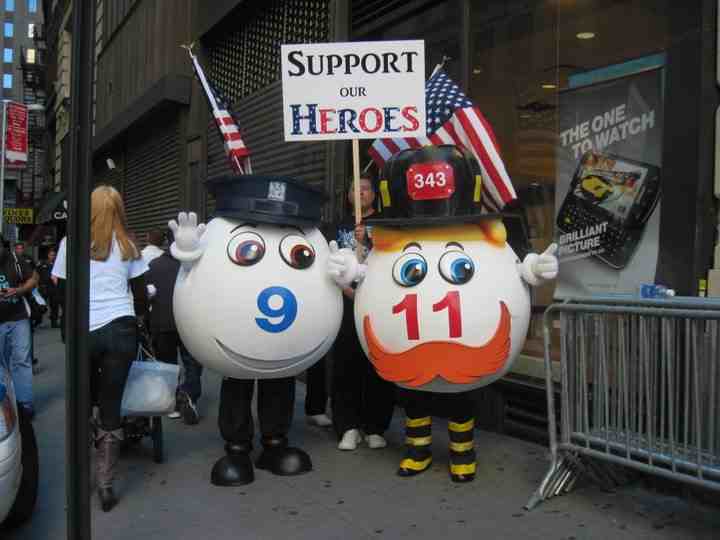 This is a picture of my “favorite” 9/11-related offense last year: people dressed as a firefighter and police officer lottery balls. They were on a corner a couple blocks from Ground Zero while the Naming Ceremony was going on, and people were posing for pictures with them. Any holiday or important date seems to be fair game for exploitation. We see Martin Luther King weekend mattress sales, after all. Ground Zero may be considered hallowed ground, but the event itself is often used in a disrespectful and purely mercenary way. I’m of two minds here. Many excellent books have been written about the attacks, heroism and recovery efforts: Requiem by Gary Suson, Firehouse by David Halberstam, and of course Tower Stories: An Oral History of 9/11 by Sunday’s guest blogger, Damon DiMarco come to mind. Should their efforts not earn them money? 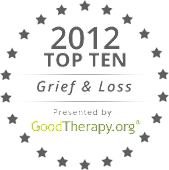 Should they be expected to give away their profits when writing about a tragedy? Remember the POW bracelets during the Vietnam War? I had one, though I don’t remember what happened to it or the man whose name was engraved on it. I didn’t think it was tacky at all. But last spring, when I saw similar bracelets being sold across the street from Ground Zero with victims’ names on them, I was offended. The money paid for them would benefit the Visitors Center. But I think I felt they crossed a line, and the line was using individual names. This morning, Ground Zero was bustling with police, security guards, construction workers and tourists. There was an air of expectation, but not quite excitement. I was interviewed by an Argentine journalist as we stood in front of St. Paul’s, and we agreed the air felt tense. In fact, she felt uneasy with what she considered a lack of (obvious) police presence. There are tours of the area by a number of groups now, as well as commemorative books being hawked on the corner across from St. Paul’s Chapel. The WTC Visitors Center – as well as any bookstore – sells books, posters, key chains, t-shirts, coloring books, and DVD’s. Tourists posed for pictures with the Freedom Tower in the background. They marveled at the construction progress and stared at police. A New York health club recently ran afoul of public opinion when they offered a special for first responders (active duty only; no retirees). A commemorative booklet of Bible verses was being given out by a Baptist group from Ohio. The souvenir shop across from Ground Zero sells “Never Forget” t-shirts. The New York Times is promoting their commemorative Sunday issue. So, is Ground Zero a construction site? A tourist destination? A cemetery? It’s all of these things and more. It will never be just one thing to everyone. But it would be nice if we could dispense with the tacky souvenirs.